Every culture has some form of flat baked or griddled dough. 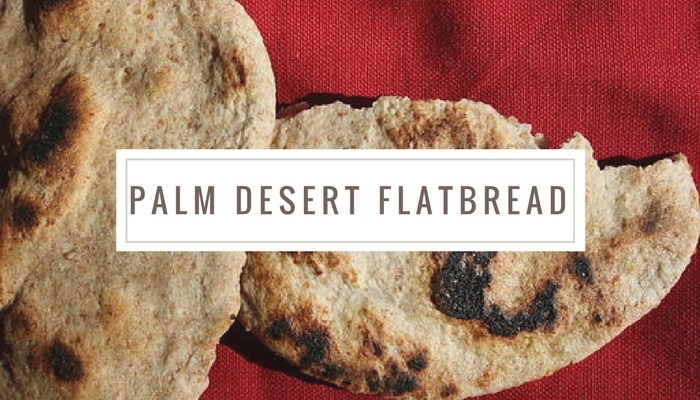 We have the pancake, the tortilla, the crepe, and for us in the Coachella Valley, we have flatbread. Isn't it just pizza dough? Well, yes technically, but our flatbread is often baked first and then topped rather than the other way around. The herb flatbread at the Coachella Valley Certified Farmers' Market is amazing! The flatbread was among the first bread ever made by humans and it makes sense because there is no yeast and it doesn't need time to rise. The owner uses all natural and organic ingredients and it's even vegan! She uses herbs from her own garden and while it's great on its own, we use it for many things in our household. Simply dip it in a mixture of balsamic vinegar and really good olive oil. Spread with Nutella and sprinkle with flaky sea salt. Smear hummus on it and top with olive oil. Use it to make a pizza with just about any kind of topping you like. Mince up garlic and make a paste with olive oil. Spread it on the flatbread and top with more herbs, goat cheese, and figs. Sprinkle cinnamon and sugar on it after smearing it with butter. Spread bread with BBQ sauce and top with grilled, sliced chicken, thinly sliced red onion, shredded mozzarella and cilantro, bake for just a few minutes at 400°. Sprinkle shredded mozzarella and brown sugar over the bread and broil 2 minutes. Spread melted Brie cheese over the bread and top with sliced apples and arugula. Drizzle honey over the bread and top with fresh or frozen, drained blueberries, caramelized onions, and feta cheese. Use the garlic oil above and top with gorgonzola cheese, sliced steak, and peppery watercress or arugula and drizzle balsamic vinegar over it all. Spread with smashed avocado, sliced tomatoes and a poached egg with a good dose of salt and pepper. Spread blue cheese over the bread and top with sliced pears, walnuts and spinach or arugula. Use garlic oil above and top with cooked shrimp, red pepper flakes, and parmesan cheese. Top with feta cheese, sun dried tomato, kalamata olives and pine nuts.